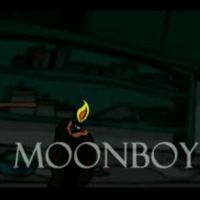 Moonboy is a short film by Adam Calfee. It is about a young boy who has gotten all fed up with what the television has to offer. “There has got to be more to life than this,” he seems to be thinking, while channel surfing and catching one lame TV commercial after another. What does he do? He aims for the moon! The creative design of Moonboy is simply awe-inspiring. The film boasts of amazing colors to contrast the deceptively simple illustrations. It also makes good use of subtle elements like shadows and natural facial expressions that make each frame very creative and playful in spite of the darkness in the young boy’s thoughts. I particularly like how the moon looks so magnificent and real, although the stars could use a little more playfulness. For instance, the night sky could have looked even more astounding with the hint of a nebula. But overall, the short film is already a visual feast as it is. The background music, inspired by Moonlight Sonata, was composed by Reid Wellock specifically for Moonboy, lending a perfect melancholic mood for what is going through a fed up boy’s impressionable mind. Additional animation was done by Gus Trauth, CGI by Jordan Held. The story of Antoine de Saint Exupéry’s The Little Prince comes to mind when the boy is seen standing on the moon. That quick connection evokes a deeper appreciation for the film, because there is so much behind its simplicity that one just cannot help but feel in the end. Now I’m off to embed this video on my Facebook for my playmates to see. *You need to be logged into Vimeo to download the video. The download link is on the lower right of the screen.